The Solemnity of Saint Joseph is for many Catholics (especially Italians) a beloved annual respite from the Great Fast of Lent. I would like to offer three reflections in the coming days as a sort of “triduum” as we approach this feast on March 19th. How many men named Joseph would you guess are mentioned in the Bible? I was surprised that I was able to find at least twelve different Josephs. The most obvious Joseph is the foster father of Jesus, but he is certainly not the only one. I propose that we may be able to learn from a closer inspection of two of the other Josephs. Thus, our first reflection will consider the man we shall call Joseph of Egypt, the son of Jacob who becomes a major character in the Book of Genesis. In the second reflection, we shall reflect upon Joseph of Arimathea, the man in whose tomb Jesus was buried. And finally, in the third reflection, we shall focus solely upon Joseph of Nazareth, the foster father of Jesus. Most people know more about Joseph, the son of Jacob, than they might think. He is the Joseph who wore the “coat of many colors.” He is the Joseph who had wild dreams and could interpret other people’s dreams. He is the Joseph who was one of twelve brothers. So, things started out fairly well for this Joseph. He had a good background. But things went rapidly downhill. His brothers all turned on him and decided to kill him. Then, rather than actually kill him, they decided to sell him into slavery in Egypt for twenty pieces of silver. While he was in Egypt, a woman named Potiphar tried to seduce him, but, when he resisted, she made a wrongful accusation against him. Then he was thrown into prison unjustly, all the while cut off from his home and family. What caused everything to fall apart? Genesis 37:3 presents the ironic key to understanding this sudden turn of fate. In that verse, it is written that “Israel [Jacob] loved Joseph best of all his sons, for he was the child of his old age.” It is this love, strangely, that becomes the cause of Joseph’s downfall. Because Jacob had shown favoritism to his son Joseph, the other eleven brothers became jealous. They saw the way their father treated him better, and it became the key to his undoing. 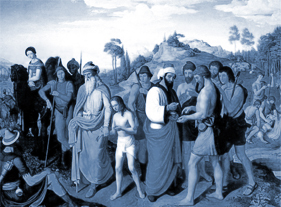 So, what does the Old Testament story of Joseph of Egypt have to teach us? It tells us something about the love of a father, which needs to be constant & fair & strong. Whereas Jacob made a mistake by favoring one son over his others, God the Father never makes that mistake. God the Father, to be sure, has an intense love for Jesus, His Son. But here is an unfathomable truth: God does not love us any less! All of us who have been baptized are God’s children by adoption—truly beloved sons & daughters. And He loves all of us with the same intensity with which He loves Jesus. What an incredible blessing: God the Father does not love us any less than He loves God the Son. Saint Joseph was a good Jew who knew his Bible, so he would have known & loved & been inspired by this story of his namesake, Joseph of Egypt. Although Saint Joseph had only one son, not twelve, he is still a father to all of us, inasmuch as he is the “Patron of the Universal Church.” He would have learned from the mistake of Jacob, who “loved Joseph best of all his sons.” Centuries later, this story taught Saint Joseph how to love Jesus with constant, fair, and strong—fatherly—love.